$40 for a set (shipping extra). Comes in a lovely velvet bag. To order your set today, click here. Thanks so much Gail. I want you to know that Merle & I choose one of your cards every day & it has certainly made a big difference in our lives. Let the ladies know how wonderful it is to have a message to live by every day of your life. You certainly make a difference in our lives. The Wise Old Owl Knows, Do You? Do you Trust Yourself and Source? yourself for the right answers? Do you Believe everything you hear on the News? What is NEXT? What is my PURPOSE? 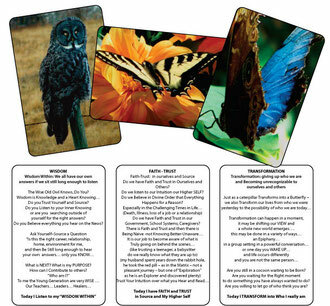 Today I Listen to my "WISDOM WITHIN"
Hello, My name is Layla, and I live in Victoria, BC, Canada - I am excited to share my "Wisdom Within-Living in Balance" Oracles Cards with you. I have a Passion for Photography and had several requests from others to share some of my photos, little did I know it would come together as it has in this deck of oracle cards. I always knew I wanted to publish some of my photos so I thought this is the perfect way to share them. I used a regular point and shoot digital camera for all of my photos, not much editing, just cropping, lightening and darkening the photos. The writings came as I sat at the computer... Most of my photos are around Victoria, Vancouver Island, Alberta, Cuba and Australia.